You spend a lot of time and money on carpentry. Perhaps it is your livelihood or an intensive hobby. Either way, you need a reliable source of materials, especially quality nails. You have come to the right place. FastenerUSA offers the choice and convenience that you need to complete your projects with durability and punctuality. If you use a nailer, you can select them from coil and strip nails compatible with a number of tools. Our nails come in a number of different angles, gauges, heads and metal types. Stainless steel is an excellent choice if you are concerned about discoloration on projects that will sit outside or be exposed to high humidity. You can also select from two types of galvanized products: hot dip and electro. If you are a roofer, you will find exactly the coil nail you need, both smooth shank and ringed. Lengths start at 3/4" and go to 1.75" coming in many varieties that offer cost savings. If you need a copper roofing nail, we have those, too. Perhaps you are handling both ends of the house: the roof and the hardwood floor. If that is the case, you will need flooring cleat nails, also available here. One big advantage of ordering from us is that many of our products come with free shipping in three to five days. You do not need to head out to the big box store or the specialty supply store. You will receive exactly what you ordered delivered directly to your door. Why waste time driving to and looking through all the aisles at the store? Another benefit is that, when ordering here, you will spend only on what you need. At the store, there are all kinds of temptations, and most of the time you end up buying more than you need - a new staple gun, that packet of sandpaper, or just a screwdriver. Save time and money and order from us today. For the most complete and comprehensive selection of stainless steel finish nails in the market, choose only quality products from Fastener USA. We provide only high quality; durable stainless steel nails in convenient MiniPak, TrimPak, Box and even Variety pack selections. As materials and techniques continue to evolve, we work hard to keep up with the changes in technology and the construction industry to serve your needs better. No matter how simple or extensive your project is, our products offer optimal fastening solution. For any kind of outdoor project, you need to make sure that the construction is seamless and that the nails will not rust and/or cause discoloration. This is why stainless steel trim nails from Fastener USA are the optimal choice. Because of the unique alloy composition of our stainless steel finish nails, they are corrosion and rust-resistant and have a long life expectancy. Unlike other products that might stain or compromise the appearance and integrity of the structure, our finish nails are specifically designed for installing trim on the outside of homes and commercial establishments, as well as for projects that make use of pressure treated wood that tend to corrode other types of nails. Ideal for a variety of other construction projects and applications, our nails are meant to complement other materials for a clean, seamless look. If you want to securely fasten trim and moulding onto framing, fencing, or decking without worrying about the nails rusting or streaking the surface, our products are the best, most reliable choice. This ensures that you don't have to waste time or money removing unsightly rust on outdoor applications due to nails that aren't stainless steel. Finish carpentry and trim woodworking projects that make use of ACQ pressure-treated lumber, cedar, redwood, and acidic or oil-based exotic woods. 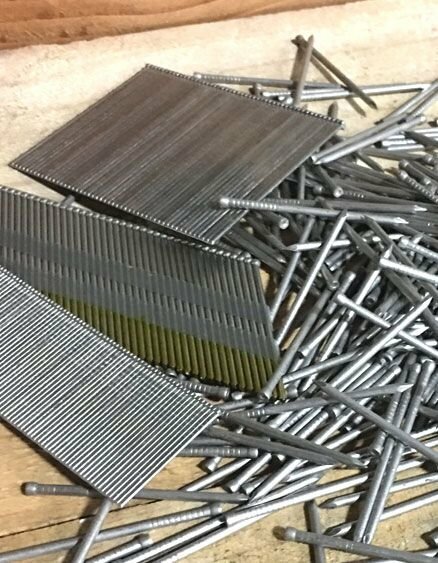 From straight and angled trim nails to micro pins and brads, you can be sure to find the right stainless steel finish nails for you project here at Fastener USA. We understand how much quality and finishing the work on time means to your construction project, so make sure to order your supplies from a reliable source. Contact us to order products from Fastener USA today. Order from us today and experience fast and free shipping nationwide!